In Kastoria, a small city in northern Greece, a monumental icon of the Prophet Elijah was painted as a figure of benediction at the end of the twelfth century. 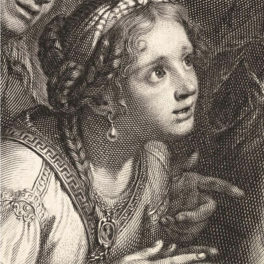 This image was likely placed in the templon (sanctuary screen) of one of the city’s numerous churches. In this location, Elijah was easily accessible to members of the congregation, allowing him to intercede with God on their behalf. 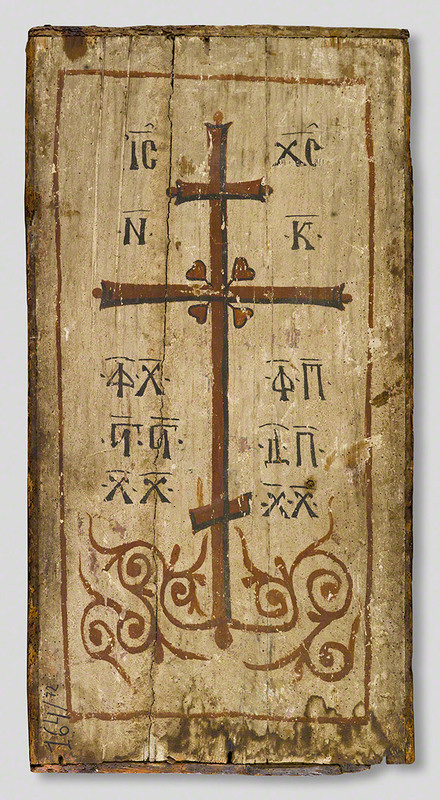 The reverse side of the icon is painted with an image that was only visible to the clergy: a foliate cross framed by abbreviated words evoking biblical and liturgical texts. This side of the icon features abbreviated words from ecclesiastical texts. One of these phrases, “The light of Christ, etc.,” is exclaimed by the celebrant during the Pre-Sanctified Liturgy, although it also occurs, along with these other letters, on the monastic schema, a kind of short stole worn around the neck and covering the chest. Many aspects of the Elijah icon—the dark blue background, schematic garments, and brilliant yellow halo—have been reworked since it was first created. Nevertheless, Elijah’s identity is unmistakable. His unkempt, ascetic appearance reflects his time spent in the wilderness. He also wears his signature sheepskin mantle, which his disciple, Elisha, is said to have grasped desperately as the prophet ascended to heaven. When Was the Icon Made? Although we don’t know what church originally housed the icon, we do know when it was made. It can be dated to between 1180 and 1200 by comparison to monumental paintings made around that time from several churches in Kastoria, including Hagios Nikolaos tou Kasnitzi, Hagioi Anargyroi, and Hagios Stephanos. The Elijah icon also bears similar features to an icon of Christ Pantokrator (now in the Byzantine Museum of Kastoria) from the nearby village of Kato Perivoli. 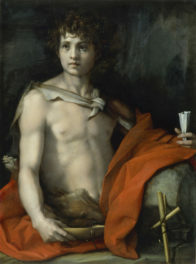 The date is also supported by the icon’s artistic features: Elijah’s strikingly emotive expression (achieved almost entirely through his intense gaze and furrowed brow), the use of subtle flares of red to emphasize key features and the pronounced striations of his hair are all typical of Byzantine art of this period. Why was Elijah selected as the subject of a devotional painting at this place and time? 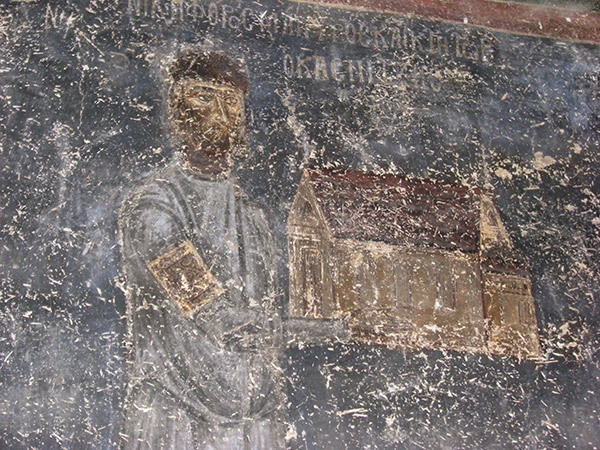 In Kastoria, the prophet is represented in ecclesiastical paintings and on large-scale icons intended for use in churches. 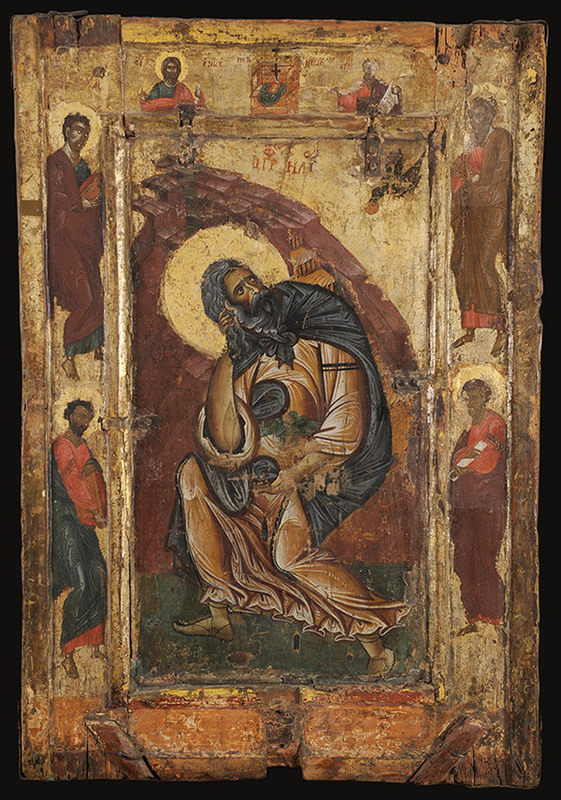 In addition to the icon on view in Heaven and Earth: Art of Byzantium from Greek Collections, a second large, two-sided icon of Elijah from Kastoria has also been dated to the late 12th century. To understand why Elijah was so popular in Kastoria, we need to look to the icon’s wider physical setting: the city for which it was painted and, on a larger scale, the Mediterranean. 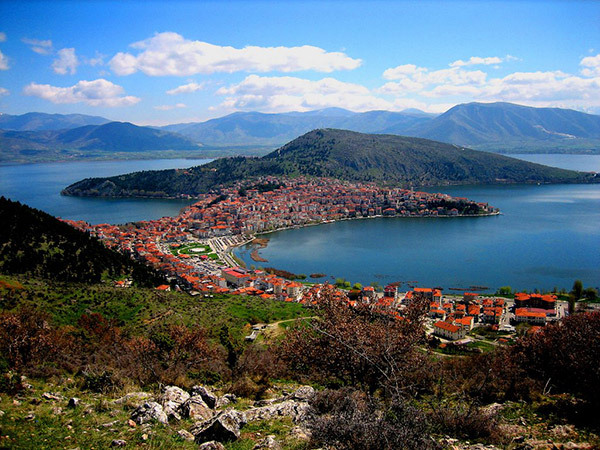 The city of Kastoria, northern Greece. Nestled within a hilly promontory, this city is protected on three sides by a lake that shares its name and once provided an important trade commodity. Though some argue that the name “Kastoria” refers to the mythological hero Castor, another association is perhaps more compelling: in Greek, kastoria means “place of beavers.” In fact, trade in beaver fur became the mainstay of this city’s commercial life. In the Early Byzantine period, animal pelts were still associated with fur-clad barbarians and thus could hardly be deemed desirable luxury items. This trend continued in Byzantium even as fur trading flourished in the Islamic world of the 9th and 10th centuries. By the time the Elijah icon was painted, though, references to treasured furs appear increasingly in elite texts—the Byzantine aristocrats, it seems, had begun to see the benefit and beauty of these “barbarian” garments. It is also around the year 1200 that Kastoria is mentioned in a chrysobull, a gold-sealed act, to the Venetians. Merchants from the Serenissima dominated Mediterranean commerce, particularly the fur trade. While this mention of Kastoria does not prove that the city participated in the fur trade specifically, it does highlight its commercial importance. The church of Hagios Nikolaos tou Kasnitzi, dated to the end of the twelfth century, features a fresco of the church’s founder next to the Prophet Elijah. Kastoria’s entrance into the fur trade is not confirmed by written sources until the 15th century, but it is possible that the city was involved from an earlier period. At some point in the history of Kastoria, the Prophet Elijah came to be known as the protector and patron of furriers. In the late-12th-century church of Hagios Nikolaos tou Kasnitzi, the prophet features prominently alongside an image of the church’s founder. Stylistic parallels between frescoes from this church and the Elijah icon are striking. What is even more striking, though, is how prominently Elijah features in the church’s decoration. Nikephoros Kasnitzis, the church’s founder, is depicted directly above the main door of the narthex presenting a model of his church with his wife Anna beside him. In the register next to Anna is Elisha, Elijah’s disciple; and next to the donor stands Elijah himself. Having Elijah and his disciple flanking the church’s founders in such a conspicuous arrangement cannot have been accidental. Furthermore, while representations of furs and fur-lined garments only really begin to appear in the 13th century, Nikephoros is depicted wearing a fur cap. It is possible that Kastoria, conveniently situated at the crossroads of major east-west trade routes (including a branch of the Via Egnatia), may have been caught up in the growing fur trade from early on. Not only has Kastoria remained a major processer and exporter of furs and fur-lined garments to this day, but it also retains the Prophet Elijah as protector of this enduring industry. Today, the Kastorian Fur Association is named “O Prophetes Elias”—The Prophet Elijah. This association claims that the city began processing furs around the 13th century; eight hundred years later, the International Fur Fair of Kastoria, Greece, is held annually at the beginning of May. 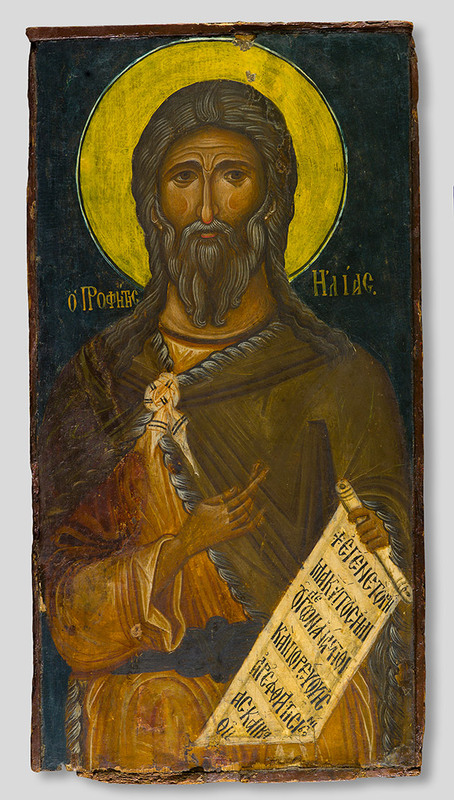 It is tempting to think that among those churchgoers who first venerated the Elijah icon were Kastoria’s furriers, asking blessings of the prophet for an industry that still thrives to this day. 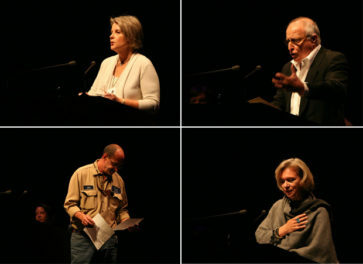 Thanks to Angeliki Strati, director of the 16th Ephorate of Byzantine Antiquities, Kastoria, for granting permission to publish images of the two icons; Amalia Gkimourtzina for providing the image of Nikephoros Kasnitzis; and the administration board of the Kastorian Fur Association Prophetes Elias for sharing the organization’s logo. For additional reading, see M. Parani, “Intercultural exchange in the field of material culture in the Eastern Mediterranean: the evidence of Byzantine legal documents (11th–15th centuries)” in Diplomatics in the Eastern Mediterranean, 1000–1500: Aspects of Cross-Cultural Communication (Brill, 2008). Text of this post © Chrysanthe Pantages. All rights reserved.